Malta was recently voted the ‘Best place to spend Christmas’ by CNN. It stole the title two years in a row due to the many activities and great atmosphere the locals love to create at this time of year. How about making your Christmas in Malta special? Here are 5 things we recommend you do during the Christmas Season when in Malta. Live cribs happen in practically every village. The locals go through the trouble of creating authentic nativity scenes that run for days on end. The costumes, props and even an-imals are totally authentic. The best ones often even have a mother with a young baby impersonating Holy Mary and baby Jesus. Real cows, donkeys, sheep, horses and chickens walk the streets with Roman soldiers, farmers, shepherds and an inn-keeper. Like all Maltese celebrations, most of these nativity scenes also come with a series of stalls selling warm food and the odd cup of mulled wine. Some cribs you certainly must check out are the ones in Lija and Ghajnsielem in Gozo. A yearly staple for local children and grown-ups of all ages is the Christmas Pantomime. Based on a different fairy tale or story every year, the Manoel Theatre Christmas Panto-mime contains humour for all ages. Very visual and brash, it is usually a local distortion of a well-known story, somehow politicised and often exaggerated but always funny. If you’re looking to spend some light time with loved ones, the ‘Panto’, as it is known locally, is a must-see. If you’ve never been, you will be fascinated by the Manoel Theatre. We highly recommend you book a box to watch the show as it is usually the best angle to do so. Another way to spend a Sunday afternoon or evening during the Christmas period is to visit Valletta. The atmosphere here is not like any other shopping destination. Valletta is full of charm on a regular day – at Christmas it feels like another world. With Christmas decorations and Christmas carol singing in the streets, Valletta becomes the place to hang around at Christmas. Get up there with friends for some shopping and spend a leisurely evening dining in the open-air restaurants in the city. Although the weather gets colder in the winter months, it is still not cold by European standards and most restaurants have outdoor fire heaters, making it still possible to enjoy the outdoors at Christmas. Malta is still largely Christian and Christmas eve is celebrated in almost every local church with midnight mass, where a young boy says mass instead of the priest. The boy represents Jesus. This tradition has been kept up in Malta for many, many years. Many churches start off the celebration with a procession in the streets, then mass inside the church. A recent addition to local traditions is the Christmas market, which often takes place in early December is solidly becoming a yearly staple. The most popular markets are the Artisan market, which happens in the first week of December in lower Valletta, just below the bastions. 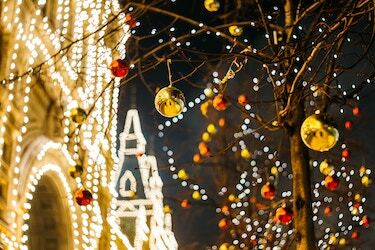 Other markets that are becoming increasingly popular year-on-year include the Corinthia Christmas gift market in Attard, the latest addition at Villa Lia in Lija, and the Natalis Notables market in Rabat. So, plan your Christmas Season fun-day trips with friends or family and jump into your GoTo car to beat the crowds and avoid parking problems.